Achieve higher levels of proficiency in a shorter amount of time! 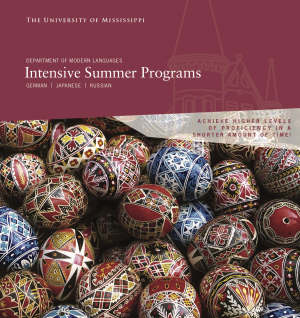 Intensive Summer Programs are offered through the Department of Modern Languages at the University of Mississippi. Students in the program build their fluency in German, Japanese, and Russian through on-campus study and intensive language study in an international location. The program begins the summer before a student’s freshman year at the University of Mississippi. Students who are currently enrolled at the University of Mississippi are also encouraged to apply. No prior language experience is required. In fact, students with no prior language experience are preferred as the students will embark on the language learning experience together. The program is structured so that you can complete your minor in the language of your choice in 2 years. Enjoy smaller classes, a collaborative language-learning environment, and the opportunity to study the language in the country where it is spoken. For the first summer on-campus, entering freshman who apply to JumpStart are eligible for a 2.5 hour tuition scholarship. Limited scholarships are available for the study-abroad component of the program, depending on the language. Summer I (prior to Freshman Year): This on-campus intensive language immersion offers six hours in the language of your choice. Housing is available on campus in residence halls and classes will be taught by a University of Mississippi instructor. Fall Semester I (of Freshman Year): Students complete the first intermediate-level course. Spring Semester I (of Freshman Year): Students complete the second intermediate-level course. Summer II (following Freshman Year): Students participate in the approved 4-week study abroad program, earning six hours of credit. Fall and Spring Semester II (of Sophomore Year): Participants complete their remaining upper-level credits to earn a minor in the intended language. If available, interested students may continue on in their language study to earn a major. The application deadline is April 21st. The priority deadline for students seeking a scholarship in the German program is January 15. To apply, you must first submit an application for admission to The University of Mississippi, and then complete the Special Programs & Scholarship Application on line. For more information on the Intensive Summer Programs, please contact the faculty representative for each language.